Thank you for attempting to purchase the “Snow Leopard Vest” by Lee Alex. This item is no longer in stock and not available for purchase through the Magic Waistcoat pages. Please contact your local dealer if you wish to purchase this item. It is only available in very small quantities through the wholesaler Murphy’s Magic Supplies – your local dealer should purchase this for you from the wholesaler. Ask yourself if it is "Time for a Change?" Finally my webmaster has got around to updating the Magic Waistcoat website. The news has been updated – shockingly the last time this was done was back in July last year! The new lecture notes/book “Time for a Change?” are now available for purchase through the website, as are “Magna-seams”, the fastest set-up quick change gimmick, used in my own repertoire. Magic Societies wishing to book or enquire about the lecture “Time for a Change?” may now do so through the web pages by choosing the “Lecture” tab . The Snow Leopard will soon be extinct! Personally I have no more Snow Leopard Vests – these are only available through your dealer. Dealers may still buy these in limited quantities through Murphy’s Magic Supplies. Once they are gone, they are gone! Istanbul is the only metropolis in the world situated on two continents – Europe and Asia! At the beginning of next month we will be bringing “Magic Dreams” to the Asian side of the city for the first time. The show is planned for Sunday 10th May at the YSM Maltepe Yayla Sanat Merkezi. One performance in the 755 seater theatre will take place at 17:00 (that’s 5:00pm to you and me!). I have just received news from Jeff that the dates for the “Focus On Quick Change” may change pending Jeff’s tour in China. The proposed change will bring this class to occur AFTER Magic Live in Las Vegas. M-U-M (Magic, Unity, Might) magazine (the magazine of The Society of American Magicians) by Jim Kleefeld. Colour Changing Waistcoat. 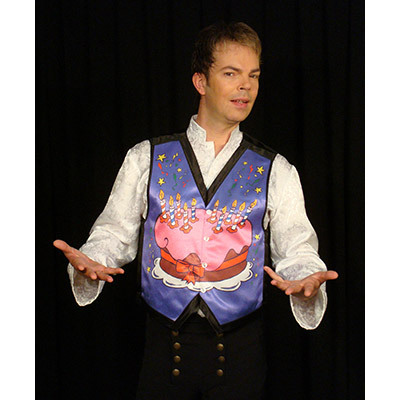 The performer wears a good–looking white satin vest, and with a quick turn, a sweep of his arm, or a misdirective flash of light, the vest front changes to show a black line drawing of a birthday cake. Another sweep and it changes again to show the same cake, now brightly colored. Another gesture and the candles on the cake light up. anniversaries, for example—it’s a perfect piece to use as a transition at children’s birthday parties. You can make a lot out of closing your show with the vest. Do the quick change, light the candles, have the kids “blow out” the candles, and then and scoot them off to the cake table, leaving you alone to pack up your gear. The effect is simple, the change is easy, and the design is superb. one-handed, as is the lighting mechanism. The thorough instructions are not only printed with full color photographs, on heavy glossy paper, but a DVD is included as well. Having the candles light up is a terrific idea, and the gimmick that permits it is well constructed. Two light panels and the battery compartment/circuit board/switch box are all small, and perfectly placed. Each of these pieces is plug-in and held in place with sturdy fasteners which means any or all can be removed to have the vest dry-cleaned, or for repairs, or replacement. The holes in the material where the lights show through are laser-cut and finished to prevent fraying and wear. The vest is available in M, L and XL and there is an adjustment strap in the back so most people can fit it to their shape. To my thinking the unit runs a tad on the small size, so if you are wavering on what size to order, get the next larger one than you might normally wear. And please, not everyone can wear a vest, so consider your own height, weight and general appearance. This is an exceptional prop: durable, very usable, and well designed. Your only consideration is whether you want to pony up for the hefty cost. Happy Birthday Waistcoat is not cheap. It is $110 more than the high-end Colour Changing Vest. But it is a long–term investment. Do you want to stand out above the rest of the birthday party performers? Some may think it’s too expensive for a quick visual trick, but it could really set you apart from the competition, especially if you use it as a highlight and a transition, close out your show with a novel finish, and teasing it in your marketing. The word of mouth advertising alone could get you plenty of extra birthday party gigs. In the news in Izmir! In anticipation of next weekend’s shows in Izmir, the local press has shown a lot of interest (it is the first time “Magic Dreams” will play outside of Istanbul). The production company has been following the news. Here are just a few of the items that appeared in the Turkish press this past week. "He will enchant with his magic!" "Illusionist of the Year Lee Alex is on his way!" "Be Ready to Fly with Magic Dreams!" The middle of May I will be bringing the new lecture “Time for a Change?” to the UK once again (wow, second time this year, that’s a first! ), but this time concentrating only on London venues. Monday May 18th 2009 – The Magic Circle, London. This lecture was scheduled back in February, but the good old British weather (the worst snow apparently in 20 years!) meant that that date was cancelled. I am pleased to be asked back and am looking forward to meeting up with friends old and new. Tuesday 19th May 2009 – International Magic Studio. For further details please contant Martin at International (please note the lecture is not held at the studio itself, but at a restaurant venue close by):International Magic Shop, 89 Clerkenwell Road, London EC1R 5BX, England, U.K. This is being organised by Lee Hathaway of Covent Garden’s “Magic Cave”. The event is subject to a limited number of participants. Lee Alex will be flying into the UK to host a very special Quick Change masterclass at a secret location in London. For the first time I will be bringing the show “Magic Dreams” outside of Istanbul. Tuition: $295.00 ( $100.00 minimum deposit )(Wednesday through Thursday)Call Abbi at (702) 450-0021 for further information. Two sessions, 4 hours each on quick change costumes with special guest Lee Alex. Lee is the creator of the Magic Waistcoat and other products, and a leading innovator in the world of quick-change magic. Jeff McBride has used quick change costumes in his show for many years. Jeff will share many of his ideas, props, and techniques with the few lucky students that attend this class. Jeff will be Joined by Lee Alex, one of the worlds leading quick change artists and creator of “THE MAGIC WAISTCOAT”: a powerful tool for the modern magic performer. Lee Alex will present his full lecture and workshop. “Time for a change?” is a lecture on quick change for magicians. The lecture gives an introduction to quick change for male costumes using practical and innovative methods without the complications of traditional techniques. Whilst in the States I will be heading to Long Beach, California to present the lecture “Time for a Change?” to the magicians of Orange County. The lecture is being hosted by the International Brotherhood of Magicians Ring No. 96. Long Beach is a large city located in southern California, USA, on the Pacific coast. It is situated in Los Angeles County, about 20 miles (32 km) south of downtown Los Angeles. Long Beach borders Orange County on its southeast edge. Long Beach is the 36th-largest city in the nation and the fifth-largest in California. As of 2008, its estimated population was 492,642.In addition, Long Beach is its county’s 2nd largest city after Los Angeles, and also the largest city nationwide that is not a county seat. The Port of Long Beach is one of the world’s largest shipping ports.The city also has a large oil industry; oil is found both underground and offshore. Manufacturers include aircraft, automobile parts, electronic and audiovisual equipment, and home furnishings. It is also home to headquarters for corporations such as Epson America, Molina Healthcare, and Scan Health Plan. Long Beach has grown with the development of high-technology and aerospace industries in the area. I look forward to discovering this part of California, although I won’t have much time! This lecture is in between the “Focus on Quick Change” at Jeff McBride’s in Las Vegas, and Magic Live, also in Las Vegas.